One bit of wine-buying advice which has always stuck with me is: when in supermarkets, seek out the unusual. Most shoppers will choose what they know, which is why Australian wine, with its use of a handful of grape varieties as de facto brands, found it so easy to come from nowhere and conquer France’s wilfully obscure appellation system. As a result, supermarket shelves are largely full of the familiar. For them to stock something wacky, the logic goes, a member of their crack team of winebuyers somewhere must have pushed very hard for it. And for them to push very hard for it, the logic goes, they must like it a lot. And if a winebuyer likes it a lot, the logic goes, it’s probably half-decent. Popular grocery chain Sainsbury’s have just added a thrilling frisson of unpredictability to their Taste the Difference range by throwing in a few vinous curveballs, including one wine made from the excellently obscure marzemino grape (not so obscure that The Wine Society doesn’t have one too, mind). Can we assume that the TTD Marzemino, “a light, fruit-driven wine with an attractive violet and cherry aroma” (that’s off a press release) which retails at £5.99, is therefore a stonker? Well, I intend to find out, if and when the only branch of Sainsbury’s I ever go into decides to stock it. This all came to my attention after the nice folk at Sainsbury’s offered to send me three of their five new Italian offerings, but sadly the Marzemino wasn’t among them. What I did get was a very decent Barbaresco (£9.99), all red cherries and tannins with a hint of peaty smokiness, a Brachetto d’Acqui (£5.99) that some call red but looks quite a lot like pink, and weighs in at only 5% abv – less than a lot of lagers, meaning that it tastes pretty sweet and reminiscent more than anything of grape juice. It would appeal to people who don’t like wine very much but are quite fond of grape juice. Nine-year-olds, basically. It’s got an appealing spritz to it, though, and would go down pretty nicely late on a sunny afternoon, lazing on the patio of a luxurious country house while chef knocks up supper. Sadly, that’s not a situation I’m likely to find myself in any time soon, and if I a sudden lottery success should change that I’ll frankly probably have some Krug instead. Sainsbury’s suggest serving it with fresh berry desserts, but I think that would lead to sweet-and-berry-flavoured overkill and that you’d be much better drinking it earlier in the evening with olives and nuts and salted crisps. 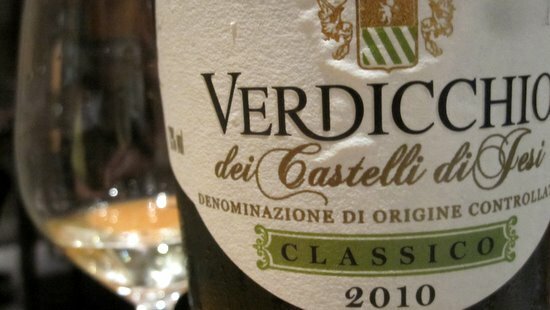 Finally, they sent me their Verdichio dei Castelli di Jesi (£5.99), which comes in a ludicrous bottle that, combined with the cheap-looking fake cork, gives an overwhelming impression of impending vinous disaster. They don’t even make an effort on the label to tell you what it might taste like, and given that absolutely every supermarket wine does that, the only possible explanation was that the contents were revolting. My nose wrinkled in anticipated horror even as I thrust it glasswards, and was utterly shocked to discover a green apple-scented, grassy, fresh summer white lurking inside. It’s extremely pleasant, impressive value for money and an always useful reminder that wines, like people, can never be reliably judged by what’s on the outside. Though there are normally a few more clues than this. The Marzemino is nice – a perfect summer evening aperitif that could be chilled if need be. Sadly I think it bombed – I don’t think it made it to our local Sainsburys at full-price, but I recently saw a few bottles being flogged off at 25% off on the RTC shelf. As you say, weird things like that have to be extra-good to make it onto the shelves at all, I’d happily buy more of it if I could find some. I’d also agree about their Barbaresco – it’s no Gaja, but perfectly acceptable as a more interesting alternative to the usual Chilean Cabernets and Aussie Shirazes that are competing in that £8-10 food wine market. I like Nebbiolo, so it’s very easy to buy.